S Cawich, M Arthurs, E Williams, D Mitchell, D Laws, J Williams-Johnson, J Plummer, H Brown. Retrospective Evaluation of Percutaneous Endoscopic Gastrostomy in Jamaica. The Internet Journal of Surgery. 2007 Volume 14 Number 2. The technique of percutaneous endoscopic gastrostomy (PEG) tube placement has now replaced surgical gastrostomy as the method of choice for long-term enteral feeding. The outcomes of PEG placement have not been evaluated since its introduction to Jamaica in 1999. We performed a retrospective audit of PEG procedures performed at a major referral centre in Jamaica between January 1999 and January 2007. There were 240 PEG tubes placed in 215 patients during the study period. 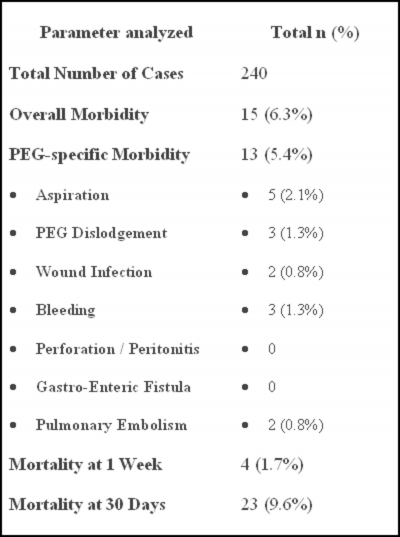 There was PEG-related morbidity in 5.4% of patients. The commoner complications included aspiration (2.1%), bleeding (1.3%), tube dislodgement (1.3%) and surgical site infection (0.8%). There were no reports of stomach perforation, gastro-enteric fistulae or intra-abdominal sepsis in this series. There was 1.7% mortality within one week of PEG tube placement and 9.6% mortality at 30 days. PEG placement is being performed at this institution with acceptable overall morbidity and mortality. Aspiration rates are higher than accepted, but may be reduced by the avoidance of over-sedation, minimal gastric insufflation and complete aspiration of gastric contents before the procedure. The technique was first performed in Jamaica in 1999. The University Hospital of the West Indies (UHWI) acts as the major referral centre for this service from other institutions across Jamaica. We report our experience with PEG tube insertion at this institution. One of two endoscopists placed PEG tubes either in an endoscopy suite or the ICU after informed consent was obtained. One of several commercially available PEG placement systems was utilized: Freka® PEG Set (Fresenius Ltd, Warrington, UK); Ponsky® PEG Kit (Bard Endoscopic Technologies, Massachusetts, USA); Cook® PEG Kit (Wilson-Cook Medical Inc, North Carolina, USA). The procedures were performed under intravenous sedation using midazolam and pethidine when appropriate. Both endoscopists used similar operative techniques for PEG. A complete upper gastrointestinal endoscopy was routinely performed. With the stomach fully insufflated, endoscopic vision was used to identify the entry point during abdominal wall palpation. After administration of local anaesthetic, a needle and cannula were inserted into the stomach. A guide wire was passed across the cannula after the needle was withdrawn. It was grasped with an endoscopic snare and pulled retrograde into the mouth. The tapered end of a 20Fr or 24 Fr gastrostomy tube was attached and pulled into place by traction on the guidewire across the abdominal wall. The internal bumper remained within the gastric lumen and the external bumper was used to secure the tube in place. A repeat endoscopy was routinely performed after the procedure to confirm the tube position and detect any complications. Feeding through the PEG tubes was routinely delayed for at least three hours after the procedure. A surgical site infection was considered present when there was a purulent discharge or positive wound culture that was associated with tenderness, localized swelling and/or erythema and was identified within 30 days of operation. Hemorrhage was considered significant when there was clinical evidence of bleeding, such as melena or hematemesis, with an associated fall in the hemoglobin concentration by at least 2gm/dl. Perforation included retroperitoneal or bowel wall leaks documented by any radiographic technique or at operation. Gastric fistulae were defined as an abnormal communication between the gastric lumen and internal viscera and/or skin demonstrated radiographically or at operation. Aspiration was considered present when there was clinical or radiographic evidence that oral or gastric contents entered the broncho-pulmonary tree. We included patients who did not have obvious evidence of vomiting, but developed signs of respiratory compromise or pneumonia (dyspnoea, cyanosis, tachycardia, hypotension and radiographic changes) in the post-operative period. All the patients who had PEG tubes placed over an eight year period from January 1999 to January 2007 were identified from the operative log. Their hospital records were retrieved and the relevant data extracted for analysis. We excluded patients who were transferred from other facilities for this service since their hospital records would not be available for analysis. The data collected included patient demographics, indications, complications and mortality. There were 313 PEG tubes placed in 289 patients during the study period. Sixty-four patients were transferred from other hospitals for PEG and they were excluded from the final analysis. Hospital records were unavailable for analysis in 9 cases. Of the remaining 240 cases, there were 95 males and 145 females, with ages ranging from 17 to 97 years (Mean +/-SD: 73+/-17). The indications for PEG are outlined in Table 1. Attempts at PEG placement were unsuccessful in two patients. One patient had an oesophageal tumor beyond which the endoscope could not pass and the other had an acute cerebro-vascular accident, but the reason for PEG failure was not recorded. After PEG tube placement, 6.3% of patients experienced major morbidity as outlined in Table II. Two patients experienced pulmonary embolism that was related to their underlying condition, rather than the PEG placement. 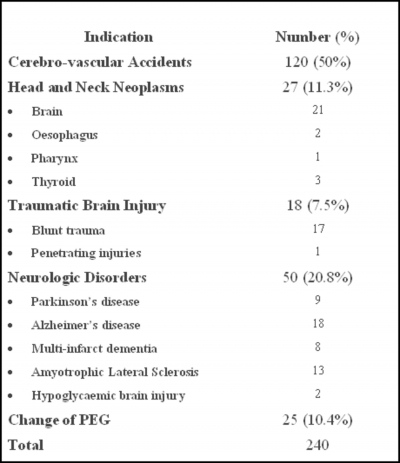 Therefore PEG specific morbidity occurred in 5.4% of patients. After PEG tube placement, 1.7% of patients succumbed to their illnesses within one week and 9.6% of patients died within 30 days of PEG placement. PEG tubes have been gaining popularity in Caribbean countries. In a recent report from Trinidad, ten PEG tubes were placed over a period of four years. (5) This was similar to the case volume at our institution, where we placed an average of 18 PEG tubes per year during the first three years after its introduction. Our case volume has now tripled to an average of 60 PEG tubes per year between 2004 and 2006. PEG placement is being performed at this institution with acceptable rates of success, overall morbidity and mortality. The aspiration rates are higher than accepted, but may be reduced by adopting the following precautions: avoidance of over-sedation, minimal gastric insufflation and complete aspiration of gastric contents before PEG. 1. Gauderer MWL, Ponsky JL, Izant RJ. Gastrostomy without laparotomy: a percutaneous endoscopic technique. J Paediatr Surg. 1980;15:872-5. 2. Loeser C, Aschl G, Hébuterne X, et al. ESPEN guidelines on artificial enteral nutrition by percutaneous endoscopic gastrostomy. Clinical Nutrition. 2005;24:848-861. 3. Lynch CR, Fang JC. Prevention and Management of Complications of Percutaneous Endoscopic Gastrostomy Tubes. Practical Gastroenterol. 2004;22:66-76. 4. Lewis BS. Perform PEJ, not PED. Gastrointest Endosc. 1990;36:311. 5. Bartholomew MM, Mohammed SL, Williams DH. Percutaneous Endoscopic Gastrostomy in Trinidad and Tobago. West Ind Med J. 2003;52(4):278-280. 6. Grant JP. Comparison of percutaneous endoscopic gastrostomy with Stamm gastrostomy. Ann Surg. 1988;207:598-603. 7. Tanker MS, Scheinfeldt BD, Steerman PH, Goldstein M, Robinson G, Levine GM. A prospective randomized study comparing surgical gastrostomy and percutaneous endoscopic gastrostomy. Gastrointest Endosc. 1986;32:144. 8. Norton B, Homer-Ward M, Donnelly MT, Long RG, Holmes KT. A randomised prospective comparison of percutaneous endoscopic gastrostomy and nasogastric tube feeding after acute dysphagic stroke. BMJ. 1996;312:13-16. 9. Park RH, Allison MC, Lang J, Spence E, Morris AJ, Danesh BJ, et al. Randomised comparison of percutaneous endoscopic gastrostomy and nasogastric tube feeding in patients with persisting neurological dysphagia. BMJ. 1992;304:1406-9. 10. Ockenga J, Suttmann U, Selberg O, Schlesinger A, Meier N, Gebel M, et al. Percutaneous endoscopic gastrostomy in AIDS and control patients: Risks and outcome. Am J Gastroenterol. 1996;91:1817-22. 11. Campagnutta E, Cannizzaro R, Gallo A, Zarrelli A, Valentini M, DeCicco M, et al. Palliative treatment of upper intestinal obstruction by gynecologic malignancy: the usefulness of PEG. Gynecol Oncol. 1996;62:103-105. 12. Mathew P, Bowman L, Williams R, Jones D, Rao B, Schropp K, et al. Complications and effectiveness of gastrostomy feedings in pediatric cancer patients. J Pediatr Hematol Oncol. 1996;18:81-85. 13. Lee JH, Machtay M, Unger LD, Weinstein GS, Weber RS, Chalian AA, et al. Prophylactic gastrostomy tubes in patients undergoing intensive irradiation for cancer of the head and neck. Arch Otolaryngol Head Neck Surg. 1998;124:871-5. 14. Mekhail TM, Adelstein DJ, Rybicki LA, Larto MA, Saxton JP, Lavertu P. Enteral nutrition during the treatment of head and neck carcinoma: is a PEG tube preferable to a nasogastric tube? Cancer. 2001;91:1785-90. 15. Bannerman E, Pendlebury J, Phillips F, Ghosh S. A cross sectional and longitudinal study of health-related quality of life after PEG. Eur J Gastroenterol Hepatol. 2000;12:1101-9. 16. French Society of Digestive Endoscopy. Guidelines of the French Society of Digestive Endoscopy: Endoscopic Gastrostomy. Endoscopy. 1999;31(2):207-8. 17. Loser Chr, Folsch UR. Guidelines of the German Association of Gastroenterology (DGVS)-Percutaneous endoscopic gastrostomy. Z Gastroenterol. 1996;34:637-41. 18. Larson DE, Burton DD, Schroeder KW, DiMagno EP. Percutaneous endoscopic gastrostomy. Indications, success, complications, and mortality in 314 consecutive patients. Gastroenterol. 1987;93:48-52. 19. Lockett MA, Templeton ML, Byrne TK, Norcross ED. Percutaneous endoscopic gastrostomy complications in a tertiary-care center. Am Surg. 2002;68:117-120. 20. Mathus-Vliegen LMH, Koning H. PEG and gastrojejunostomy: a critical reappraisal of patient selection, tube function and the feasibility of nutritional support during extended follow-up. Gastrointest Endosc. 1999;50:746-54. 21. Abuksis G, Mor M, Segal N, Shemesh I, Plout S, Sulkes J, et al. PEG: high Mortality rates in hospitalized patients. Am J Gastroenterol. 2000;95:128-32. 22. Gossner L, Keymling J, Hahn EG, Ell C. Antibiotic prophylaxis in PEG: a prospective randomized clinical trial. Endoscopy. 1999;31:119-124. 23. Ahmad A, Mouncher A, Abdoolah R. Stenson R, Wright J, Daniels A, et al. Antibiotic prophylaxis for PEG: a prospective, randomised, double-blind trial. Aliment Pharmacol Ther. 2003;18:209-15. 24. Akkersdijk WL, van Bergeijk JD, van Egmond T, Mulder CJ, van Berge Henegouwen GP, van der Werken C, et al. PEG: comparison of push and pull methods and evaluation of antibiotic prophylaxis. Endoscopy. 1995;27:313-6. 25. Dormann AJ, Wigginghaus B, Risius H, Kleimann F, Kloppenborg A, Grunewald T, et al. A single dose of ceftriaxone 30 minutes before PEG significantly reduces local and systemic infective complications. Am J Gastroenterol. 1999;94:3220-4. 26. Jain NK, Larson DE, Schroeder KW, Burton DD, Cannon KP, Thompson RL et al. Antibiotic prophylaxis in PEG. Ann Int Med. 1987;107:824-8. 27. Preclik G, Grune S, Leser HG, Lebhers J, Heldwein W, Machka K, et al. Prospective, randomised, double blind trial of prophylaxis with single dose of co-amoxiclav before PEG. BMJ. 1999;319:881-4. 28. Sharma VK, Howden SW. Meta-analysis of randomized, controlled trials of antibiotic prophylaxis for PEG. Am. J. Gastroenterol. 2000;95:3133-6. 29. Rey JR, Axon A, Budzynska A, Kruse A, Nowak A. Guidelines of the European Society of Gastrointestinal Endoscopy (E.S.G.E.) antibiotic prophylaxis for gastrointestinal endoscopy. Endoscopy. 1998;30:318-24. 30. Snyder J, Bratton B. Antimicrobial prophylaxis for gastrointestinal procedures; current practices in North American academic programs. J Pediatr Gastroenterol Nutr. 2002;35:564-9. 31. Fouth PG, Talbert GA, Gaines JA, Sanowski RA. The gastrostomy button: a prospective assessment of safety, success, and spectrum of use. Gastrointest Endosc. 1989;35:41-4. 32. Gorman RC, Morris JB, Metz CA, Mullen JL, et al. The button jejunostomy for long-term jejunal feeding: results of a prospective randomized trial. J Parenter Enteral Nutr. 1993;17:428-31. Shamir O. Cawich, M.B.B.S., D.M. Derek IG Mitchell, M.B.B.S., D.M.